Everyone knows that doing a PhD can have its stressful and frustrating moments. These can affect not only your academic progress, but also your self-confidence, relationships, and personal well-being. So in honour of World Mental Health Day on Saturday, I wanted to write about some strategies and resources that can help you during your time at Sussex, and beyond! University Counselling Services (UCS): Located in the Health Centre Complex, UCS offers free and confidential services like one-to-one counselling, procrastination and insomnia workshops, and online self-help programmes. Student Support Unit (SSU): The Student Support Unit employs three Mental Health and Autistic Spectrum advisors, who offer a confidential service to prospective and registered students who have evidence of a long term Mental Health condition or an autistic spectrum condition. 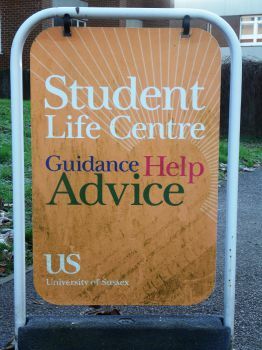 Student Life Centre (SLC): Student Life Advisors at the SLC are also available for confidential and supportive meetings, and can provide advice, guidance, and referrals as appropriate. We understand that not everyone is based on or near campus, so it’s also important to be aware of online resources that can be accessed from anywhere! Vitae is a registered UK charity that is dedicated to researcher development. As such, they have a wealth of information available on their website, with pages including ‘Overcoming challenges common to doctoral researchers’, and ‘Staying positive during your doctorate’. Blogs like PhD Life and The Thesis Whisperer post about many of the challenges that researchers face, combining practical information about supervisions, teaching, and vivas with more personal posts about researchers’ experiences, impostor syndrome, and work-life balance. Twitter hashtags like #phdchat allow you to ask a question or pose a concern to researchers from all over the world! Of course, one of the most valuable resources is your community of peers! Other doctoral researchers understand what it’s like to struggle with motivation, to feel like you’re not getting anywhere, or to lack self-confidence. If you have a problem, it’s easy to imagine that you are the only person who is struggling with it. However, interacting with researchers from outside your school – by attending Hive events or Researcher Development programmes, for example – can be hugely reassuring. You might even find that you’re able to help someone else!